Towards Tate Modern provides a new interdisciplinary account of Tate’s shifting position as a national arts institution. 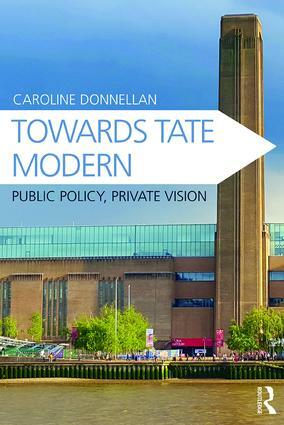 The book examines how earlier government directives impacted on Tate, which saw the organisation refocusing its aims and resulted in it pioneering new models for working across the public and private sectors. The decade prior to the opening of Tate Modern witnessed a changing political, economic, cultural and social landscape. As London was rebuilding its own vision, Tate re-configured its role as a public museum and gallery by engaging with the market. Tate re-imagined what a public museum and gallery can do, what it can look like and where it can be and, in doing so, responded to a new kind of audience with a larger appetite than before. Re-cast as a cultural and social forum, Tate Modern turned itself into a popular public event. This research considers how Tate Modern generated a set of new debates and what this might mean for the future role of the public museum and gallery. Towards Tate Modern will be of particular interest to academics and students, art practitioners and policy makers working in the fields of museum studies, policy studies, cultural studies, urban studies, and political and economic history, as well as those involved in archival research. It will also engage those wishing to widen their understanding of how an institution such as Tate Modern was created.